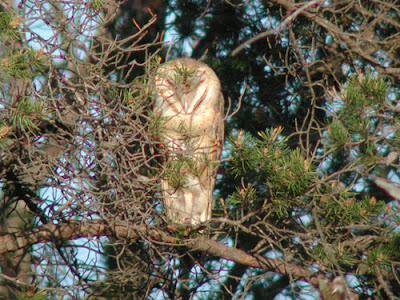 On Thursday I received a call saying that several birders were watching a Barn Owl at Tawas Point State Park in East Tawas MI! Within an hour, I was on the road. 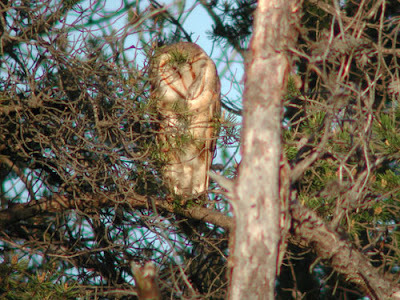 Luckily for me, the bird (which had been flighty all morning) decided to stick to its roost during my entire drive, and I was treated to four straight hours of watching this great bird once I arrived (2 hrs 55 minutes from Grand Rapids, and no tickets). On Sunday I was informed of the discovery of a Black Rail by Jon Wuepper, possibly even up to 2 or 3 individuals, in a fallow field in Berrien County. This would be a fourth state record for Michigan, and the first chasable bird since June-July of 1988, when a male sang repeatedly at Hofma Park in Grand Haven. So, I made the requisite phone calls and pulled together a search party for Sunday evening/Monday morning. We were unable to get to the site until 10:20 PM, when we were informed that despite being heard sporadically throughout the day the bird hadn't called since 8:30PM! We quickly found out exactly how quiet it was: the Woodcocks had gone to bed, and even the Soras and Sedge Wrens weren't making barely a peep. By midnight, when we still hadn't heard the bird, and had heard only a handful of Sora calls, we began to worry. The Soras you hear in this clip are coming from our mp3 player, but the Black Rail tape was not played during this time; what you hear is the real deal. But unfortunately, although I had heard a strange note in the mix during this bout, I could not say for sure whether it was a Black Rail, so I still couldn't count it! We stayed until 1:30AM, at which time, I finally heard, very clearly, 1 single "kiki doo" from the Black Rail. I didn't get it on tape, however, but for a night where we were all feeling we were going home empty-handed, it was a welcome sound. Great find- kudos to Jon Wuepper for spending time surveying the county and getting the word out!